Growing up in a Polish family in a small New England town full of other Poles, I took Polish cuisine for granted. My grandmother and her sisters working together for days to make hundreds of pierogies or scores of nut rolls and poppyseed rolls, my mom whipping up galumkis (stuffed cabbage), my Bopcha’s freshly-made chrusciki (angel wings), potluck tables laden with egg, potato, and beet dishes; these were my world. How soon after we moved away recipes and traditions were forgotten as the cooks aged and died. But memories live on, as I seek to recreate and record these recipes from the past. 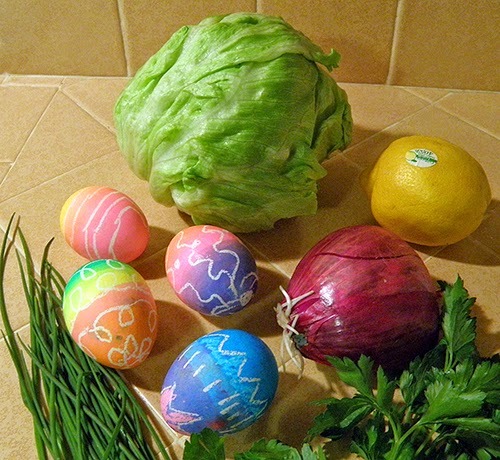 A new thrift store cookbook and a surplus of Easter eggs inspired me to delve into my Polish cooking heritage. Upon starting the Polish Cooking recipe, it looked like a lot of dressing for 1 cup of lettuce. Also, two small chopped onions seemed a bit much. So I doubled the lettuce amount and reduced the onion. 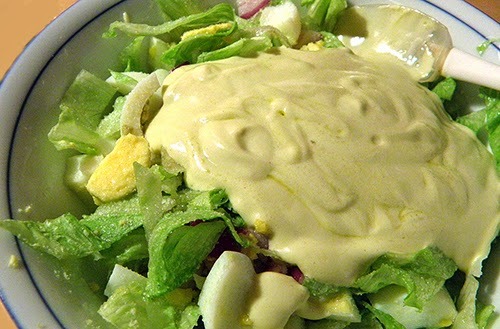 During the chilling and flavor-blending phase, after the salad is made, it still seemed like too much dressing. Into the bowl went more lettuce, onions, parsley, and chives. Apparently the original dish was more like a rich, strong chilled soup with eggs and veggies submerged in a yogurt-mustard base, served in small portions. In the end I’d made the dish into a more of a full-meal salad to be served in larger portions for lunch or supper accompanied by a bit of bread. The onion flavor is still quite strong, and an important component of the authentic Polish flavor. 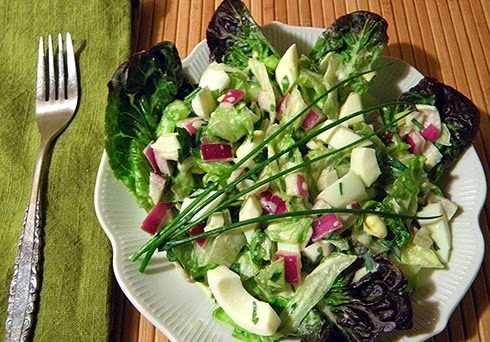 The larger quantity of red onion does add an extra spark of color, but use the smaller amount if you prefer less. 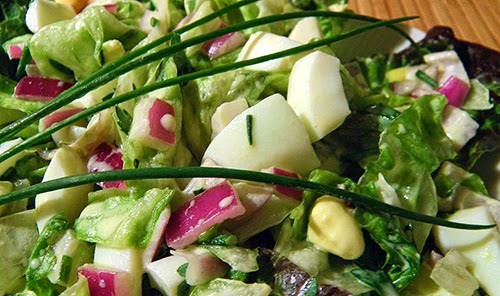 Regardless of the adaptations, my husband (also part Polish) says that the salad still tastes Polish, with its characteristic blend of parsley, onion, chives, lemon, and mustard. Remember to allow 30 minutes chill time to allow the salad flavors to blend and mellow. Na zdrowie! Combine yogurt, olive oil, and mustard in a small bowl. Set aside. 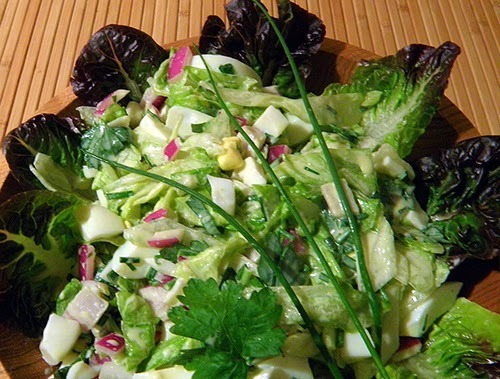 Place lettuce strips, diced onion and diced eggs in a medium bowl, mix lightly. Sprinkle lemon juice, sugar, and salt over egg mixture. Add yogurt mixture, parsley, and chives. Toss lightly to combine thoroughly. Cover bowl and refrigerate for 30 minutes, stirring up dressing from the bottom every 10 minutes. Line a large salad bowl with leaf lettuce. 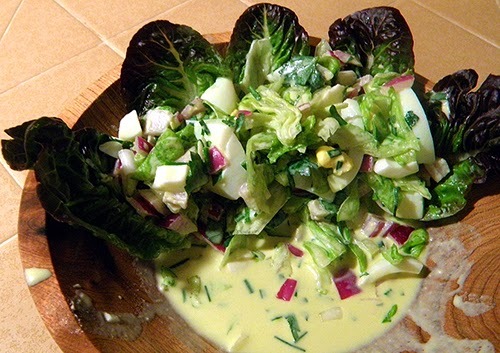 Stir egg salad gently and pile into center of leaf-lined bowl. Garnish with chives and/or parsley.